The Microsoft has created this credential to assess the knowledge and understanding of a candidate in the area as above via the certification exam. 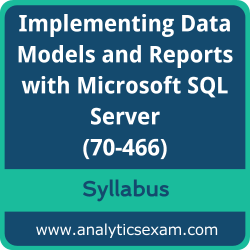 The Implementing Data Models and Reports with Microsoft SQL Server (70-466) Certification exam contains a high value in the market being the brand value of the Microsoft attached with it. It is highly recommended to a candidate to do a thorough study and also get a hand full of the practice to clear Implementing Data Models and Reports with Microsoft SQL Server exam without any hiccups.